What a night! The vibe was buzzing and so were all the models, eager to get out there and flaunt their curves on the runway. We had a long day ahead of us, filled with rehearsals with the legendary Reuben P. Joseph, hair & make up with the MCUK Glam Squad and costume changes provided by the awesome sponsors; +Simply Be , Rosie Red Corsetry, The House of Dynasty Viviana Collection, Eldimaa Fashion and many others. You could feel the nerves in the room but none of those nerves made it to the catwalk. The girls walked with poise, confidence and attitude! Reuben is a brilliant choreographer; he oozes style and confidence and has a walk that all the girls envied. Over the last few months he whipped each of us into shape, he was tough & strict but his methods worked and he transformed each of the girls from Bedroom Divas to Catwalk Models in such a short space of time. Without his knowledge, expertise & intricately precise choreography this show wouldn't have been possible. Behind the scenes the MCUK Family were hard at work preparing & maintaining calm through a sea of chaos. I'd like to take this time to thank every single one of the family & stylists for their hard work in the lead up to & on the night; you made this all possible and your efforts are appreciated. Theo, Melyssa, Valerie, Leon & everyone else; we thank you, you guys rock!! MUA extraordinaire; Lien Vy brought her A- Team to make up the MCUK Glam Squad of talented MUA's, Hairstylists & Stylists enlisted to make our girlies look fabulous! Thank you to each of you for sharing your talents with us & making us look gorgeous! If you are looking for a stylist then make sure you contact Lien Vy of Seventa Image, she will hook you up!! The event was covered by a whole host of digital media excellence; but here are some notable mentions; Carlo & Francine of Doller Crem'e, Duchess, XOCubic, Wolf Media, Dan K Photography, Petros Gilazgi, Josh Daniels Pictures. It was such an honour to share the stage with all of the finalists their pictures do not do them justice; they are by far more alluring in person and such big kind hearted women too. Every single girl was simply beautiful and poised to perfection. Any one of them could have stolen the crown. All my fellow Ambassadors looked sensational as always and we all thoroughly enjoyed strutting in our gorgeous gowns down the catwalk. The previous contestants also took the stage, all us newbies watched in awe as the pro's sashayed down the runway. The performances by UK based artists Che Lingo & Asia Love were awesome. It was anybodys' crown all of these ladies deserved it.. 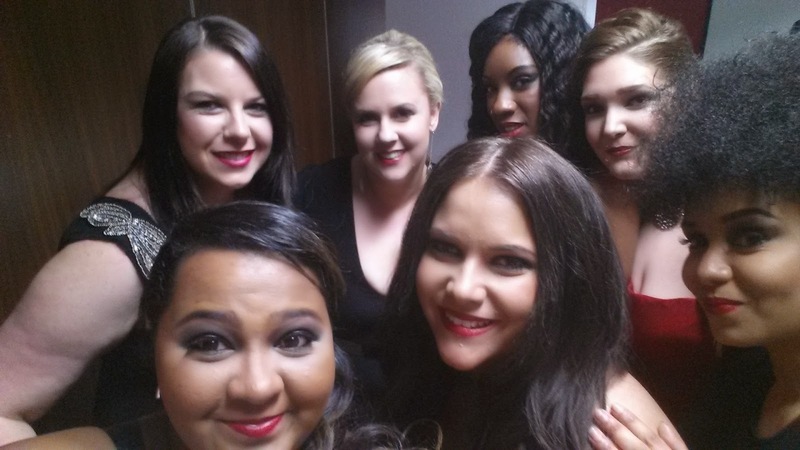 Finally...The wait was over and Cerise was crowned Ms Curvaceous UK 2015. Her aunt ran on the stage and jumped on her in excitement, knocking poor Cerise to the floor (as if she wasn't bowled over enough!) She has a huge year ahead of her with many opportunities lined up. Make sure you watch this space for an interview with her once the news has sunk in! The night was a huge success and I cannot wait for the next contest...Make sure you register your interest now for Ms Curvaceous UK 2016 via the website. 2015 is gonna be a busy year for us Ambassadors, many things in the pipeline and I cannot wait to work with this group of intelligent, beautiful & inspiring young ladies. If you missed the event don't worry, there's always another party...just don't be foolish enough to miss another!! Did you attend? Do you have any pictures to share? ?